Gigi Hadid, Bella Hadid, & Kaia Gerber Bring the Outdoors to the Runway for Anna Sui Fashion Show | 2018 New York Fashion Week September, Bella Hadid, Coco Rocha, Gigi Hadid, Kaia Gerber, Kim Petras, Naomi Campbell, Rainsford, Skai Jackson | Just Jared Jr.
Gigi Hadid, Bella Hadid, and Kaia Gerber look gorgeous in beach- and floral-inspired outfits for Anna Sui‘s fashion show! The models hit the runway for the event held during New York Fashion Week at Spring Studios on Monday (September 10) in New York City. 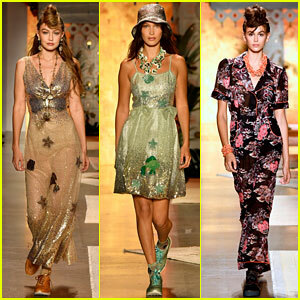 Other models who walked included Fei Fei Sun, Dilone, and Dree Hemingway. Naomi Campbell, Kim Petras, Skai Jackson, Rainsford, model Coco Rocha, director Francis Ford Coppola, and his daughter Sofia Coppola all sat front row. 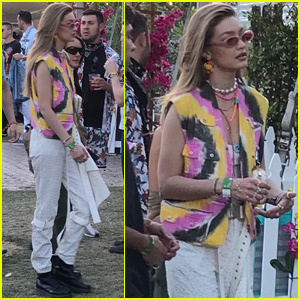 ICYMI, see pics of Gigi and Bella walking in the Prabal Gurung and Brandon Maxwell fashion shows, and check out Gigi and Kaia walking for Tom Ford.